Accident Group special investigator Paul Stott speaks out for the first time, and reveals to the BBC that fraudulent claims were much more widespread than previously believed. Paul Stott walks and talks like a policeman: from his starched shirt and black suit right down to the black polished shoes that you can almost see your face in. He says he has an eagle eye for detail but says he would have only needed one eye to have done his last job properly. Britain's fastest growing companies and which made its charismatic chairman Mark Langford one of the richest men in the country, with an estimated personal fortune of £75 million. The company's dramatic demise made headlines when company administrators fired its 2,500 strong workforce by text message. Mr Stott was belatedly employed to investigate corrupt selling within the company, and formed part of a tiny investigation unit within the group. The group has previously been criticised for setting unrealistic targets for its sales force. Speaking exclusively to BBC One's programme The Man That Made Accidents Happen, Mr Stott said that the mis-selling went much further and wider than previously imagined among its 1,500 sales people. "At a very conservative estimate there were 200 people suspected of making claims up. "With some of the people that I have dealt with, from the day that they started until their activities were brought under the umbrella of an investigatory procedure, every single claim that they wrote was fraudulent. "It was apparent to a man with one eye. "I was absolutely aghast, as was every member of the team that I worked with. "We just didn't understand how a company could continue to operate with that level of fraudulent activity going on." Mr Stott began his investigative work last autumn and continued until the day the company went into administration at the end of May. He had previously worked as a salesman and then a vetter within the company's Liverpool operation, where he found many of the anomalies, although he said there were problems elsewhere. His work is supported by reports from other investigators who also found widespread evidence of fraudulent claims. Mr Stott focused on the practice of multiple claims, the phenomenon in which a single claimant would sometimes make claims for many different accidents. Mr Stott found that some salespeople also made many multiple claims for themselves. He found one couple who both worked for the company and had made 33 claims for themselves, of which nine were accepted by the company. They made a further 40 claims for people living in their street. Not content with that, the couple made another 68 claims on two addresses nearby where their friends lived. Of these, 24 were accepted by the Accident Group. Some of these claims were submitted as far back as early 2001. 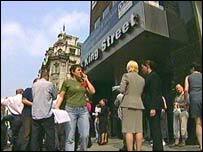 Mr Stott said that many claims went through, defeating the checking procedures the company had put into place. He said: " Working on the figures that I had to hand at the time, of the totally ridiculous claims, 30 per cent went through." He said that the people who ran the company were kept informed of the findings. "It was reported to the directors directly. Every major issue that arose, they were copied in on e-mails; any report that we generated from our department would be addressed to the directors." Q&A: What does it mean for customers?